“This was Veii then. Now, who even remembers its existence? What remnants are there? What trace? The faith of our annals has to strain to make us believe that there ever was such a place as Veii. As Florus renders it, not only does Veii no longer exist, but it stretches the bounds of human credulity to believe that it ever did! Roman historians tend to preface their works with prooemia which describe the value of history as a mode of literary enterprise, but Florus makes this point more clear than any amount of Sallustian trumpeting: were it not for histories like this one, Veii would not even exist in name. There is, moreover, something heartbreaking about the finality of it all, conveyed by the rapid succession of perfect tense verbs fuere…fuisse…fuisse. The bath of Gallic blood did not, apparently, erase all trace of the fire in Rome, because it lived on as a historical idea in the hearts of the Romans, who are presented as being vexed by the potential for Gallic control of the narrative. 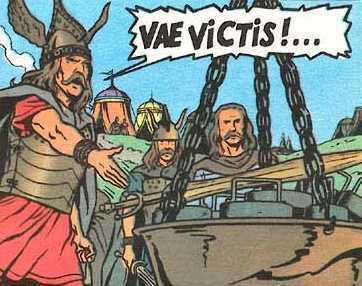 That is, these Gauls could still boast of the memorable victory over the city, so the victory had to be turned into defeat, and the rememberers themselves had to be wholly extirpated. Once again, Florus stresses the strain which these events place upon the reader’s belief. Moreover, he places the record of history against the common perception of his own time. It is worth pausing to remember that Florus, writing around the time of Hadrian’s reign in the 2nd century AD, lived through a time when Rome achieved its greatest geographical sway (around 117) under the emperor Trajan. But we all know what happened. Three hundred and fifty years later, the last of the western Roman emperors would be deposed, all of Rome’s western dominions would be fragmented, and Rome itself would be just a city once again. Even with the historical and archaeological record, the “trust in our annals” still strains in reminding us just how powerful Rome once was. This kind of patriotic puffing for cruel barbarism and outright atrocity continues throughout the rest of Florus’ work in much the same vein, though he relents a bit as he approaches the singularly inglorious period of civil wars beginning in the 1st century BCE. When read carefully, Florus’ Epitome challenges us to think about more than the horror of war itself, which is at any rate manifest enough. Florus reminds us of the danger which plagues all historical narrative: the losers have no narrative of their own, and worse than being buried in the ground, their very memory is interred in the dust of silence and oblivion.